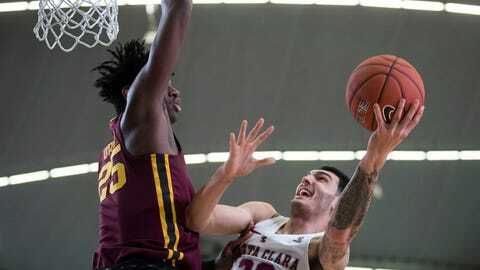 VANCOUVER, British Columbia — Gabe Kalscheur’s hot shooting carried Minnesota long enough for the rest of the Golden Gophers to pitch in and finally shake pesky Santa Clara. Kalscheur scored 18 of his 25 points in the first half, Jordan Murphy added 15 points and 17 rebounds, and Minnesota remained unbeaten with an 80-66 win over the Broncos on Tuesday night. The Gophers (4-0) struggled offensively for the first 20 minutes, but pulled away late in the second half to win their second straight game of the Vancouver Showcase. “We’re not even close to where we need to be and we’re sitting at 4-0,” Minnesota coach Richard Pitino said. Kalscheur hit six 3-pointers and scored more than half of Minnesota’s points in the first half. Santa Clara paid more attention to the shooter in the second half, but that opened up opportunities for the others. “We just had to get confidence. They were going under every ball screen and they were daring us to shoot. They didn’t think we would be comfortable shooting,” Pitino said. In just his fourth game, Kalscheur set a new high for 3-pointers made in a game in the first half. He had five 3-pointers in Minnesota’s win over Utah. “For him to be just a freshman and be able to shoot like that it’s only up from here for him,” Murphy said. Minnesota also held a major advantage at the free-throw line attempting 37 compared to just nine for the Broncos. The Gophers made 23 at the line. The foul disparity was finally enough for Santa Clara coach Herb Sendek, who was given three technical fouls in the process of getting ejected with 3:16 left after a disputed offensive foul on the Broncos. “I didn’t know it was possible. I’m going to have to find out. I thought the rule was you got two and you got tossed and weren’t able to get a third but apparently you are,” Sendek said. Tahj Eaddy led Santa Clara (0-4) with 20 points and Keshawn Justice added 12. Sophomore forward Josip Vrankic was limited by foul trouble in the second half and finished with just 11 points before fouling out late. Vrankic picked up two quick fouls and went to the bench with four fouls with 11:58 remaining. Santa Clara pulled even at 46 after consecutive 3s from Eaddy and Justice, but the Broncos struggled at both ends without Vrankic’s presence on the inside. Daniel Oturu’s three-point play gave Minnesota a 53-46 lead. The Broncos managed to hang around, but Vrankic fouled out with 4:14 remaining and the Gophers pulled away. Dupree McBrayer, who finished with 15 points, provided the capper with a driving left-handed dunk while being fouled in the final minute. Santa Clara led by as many as seven in the first half, but had its own shooting problems hitting one field goal in the final eight minutes of the half. “I think our team played well in a lot of ways. I think we continue to get better,” Sendek said. Murphy became Minnesota’s all-time leader in rebounds when he grabbed his 13th rebound. He now has 961 in his career. “It’s a really big accomplishment. Really humbling. It’s definitely something I’m really proud of,” Murphy said. Santa Clara: In the second game without all-conference guard KJ Feagin, the Broncos looked much more comfortable offensively in understanding roles. … The Broncos were called for 28 fouls in the game, 20 in the second half. Minnesota: Kalscheur was 6 of 10 shooting in the first half, the rest of the Gophers were 6 of 28. … Minnesota had a 18-4 advantage in offensive rebounds and scored 17 second-chance points. Santa Clara: The Broncos are at San Jose State on Saturday. Minnesota: The Gophers face Washington in the final game of the tournament on Wednesday.